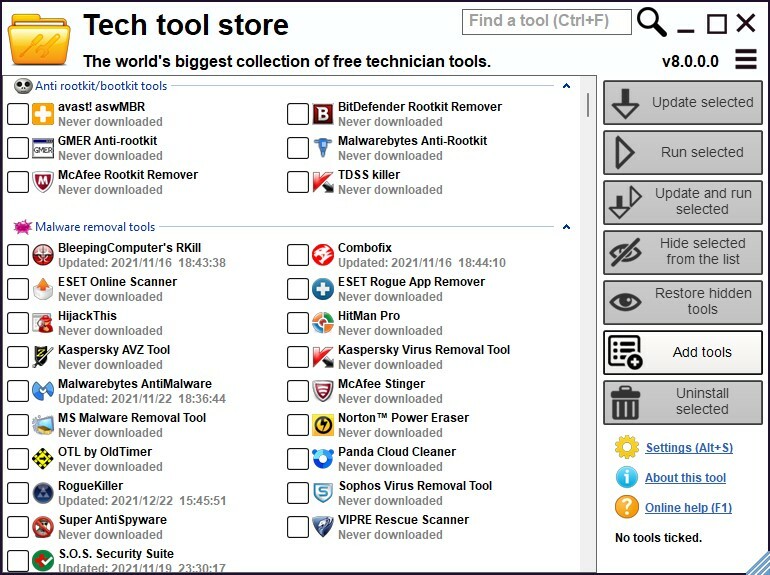 Tech tool store is an IT professional application which contains more than 600 free technician tools packed in a simple, fully featured interface. Also interested in UVK? Save $30 by purchasing the UVK and TTS bundle! To get started, don't forget to check out the Tech tool store online help! Your Tech Tool Store license was accidentally deleted? Click here to recover it! You want to report a bug or make a suggestion? Click here! What's new in the latest builds? General debugging and improvement. Also improved the UI in version 5.0. Fixed some tools that were no longer downloading or running properly. Added a new button to the list's menu: Export to UVKSR file. This new feature allows you to easily create UVK custom third party apps from Tech Tool Store tools. Added support for automation through command line switches. More info here. The description tooltip now tells when the tools are installed in the local computer. Added a text control to the bottom right part of the GUI, telling how many tools are currently checked, and allowing to quickly uncheck all. New features: Backup and Restore. Easily create backups of your TTS tools and settings, and restore them later, if desired. This feature can be found in the Settings dialog box, tabs Backup, and Restore, respectively. Added the following items to the Windows built-in tools group: Add a device, Add network location, Certificate manager, Date and time, Desktop icon settings, Display settings, Fonts folder, Keyboard properties, Mouse properties, Network connections, Notification settings, Personalization, Power options, Printers, Programs and features, Region settings, Safely remove hardware, Security and maintenance, Set up backup, Sound control panel, Start menu settings, Taskbar settings, User accounts, Windows features. CrystalDiskMark portable, to System monitoring tools. Magical Jelly Bean Keyfinder, to System information tools. RansomFree by Cybereason, to Security software installers. Account Profile Fixer, to System repair tools. InSpectre, to System information tools. Sophos Virus Removal Tool, to Malware removal tools. Easy Service Optimizer, to System tweaking tools. dupeGuru, to System maintenance tools. Notepad++ Install, to Important updates. Notepad2 Install, to Important updates. Notepad++ Portable, to Miscellaneous tools. Notepad2 Portable, to Miscellaneous tools. MSI Afterburner, to System tweaking tools. BetaFish AdBlock for MS Edge, to Important updates. Stop Resetting My Apps, to System tweaking tools. Farbar Recovery Scan Tool, to System repair tools. Comodo Removal Tool, to Security software uninstallers. Comodo Firewall Free, to Security software installers. Panda Cloud Cleaner, to Malware removal tools. Removed Battery Optimizer, as it was causing serious issues, such as corrupting the boot files in some computers. Magnifier, to Windows built-in tools. Math Input Panel, to Windows built-in tools. On-Screen Keyboard, to Windows built-in tools. Quick Assist, to Windows built-in tools. Task Scheduler, to Windows built-in tools. Windows To-Go Creator, to Windows built-in tools. WordPad, to Windows built-in tools. Snipping Tool, to Windows built-in tools. Chrome Cleanup Tool, to Adware removal tools. Shellbag Analyzer & Cleaner, to System maintenance tools.